I totally missed the boat on Gintama. A couple of years ago, I watched the first episode, it didn't really grab me, and I just abandoned it for other anime. That was a mistake, because now, having steamrolled through the first 160 or so episodes of the series, I'm thoroughly hooked on the continuing adventures of Gintoki and the gang. It's potty humor can be a bit meh, but overall I haven't laughed so hard from an anime series in ages. What I like most about the show is that it has such a deep roster of interesting characters that you'll actually find yourself caring about quickly. 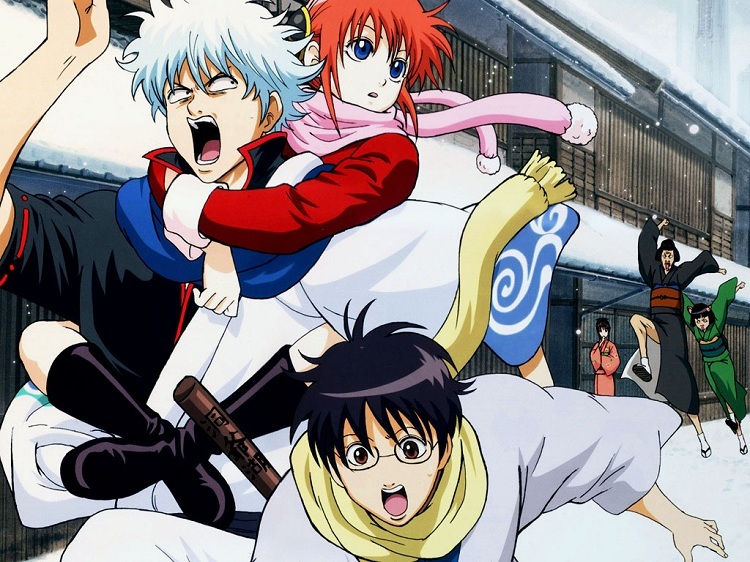 Gintoki, Shinpachi, and Kagura are often the center of attention as they go off and do their odd jobs, and they interact together really well, but I also like a lot of the other characters. Kondo is great with his somewhat oafish yet kind demeanor, Hijikata, while always grumpy, sort of grew on me, especially how he interacts with Okita, and Katsura is always good for a laugh as he can be so oblivious to stuff, and do the most boneheaded things despite seeming like such a serious guy. The core characters of Gintoki, Shinpachi, and Kagura are pretty great too, and they have a nice thing going on in how they get along. I like Gin's generally lackadaisical attitude, and Shinpachi does a pretty good job as the straight man. Kagura seems to move around between ultra violent whackiness and jibing everyone. It's hard to decide on what episode(s) I like best because from what I've seen there are a lot of really good ones to choose from. The Nabe Shogun episode definitely stands out as a favorite, but I also liked the story arch where everyone was abducted by aliens and had various parts of their bodies replaced with screwdrivers, then there was the episode where Edo had a temporary smoking ban in public areas and Hijikata travel across the universe in search of cigarettes, or when Gin and Hijikata get handcuffed together. So there's a lot of episodes that stand out for me at this point. An even harder thing for me to decide on is which character I like best. After a lot of thought, I'd have to say that I lean toward Kondo. Sure, the show makes him out to be a big, dumb gorilla, and sort of goes out of its way to make him look like a moron, but it's easy to see that he's actually a really nice guy. If there's one guy I'd want for a drinking buddy in Gintama, it's Kondo because I know I'd have a great time hanging out with him. Anyway, Gintama is fast becoming one of my favorite anime series ever. It's a bit on the potty humor side, but I'm constantly laughing at the gags, and it has so many great characters that the show has really grown on me.